and for you men out there: there are always far more women than men in mixed choirs! warm-ups improve the body’s flexibility, sense of rhythm, balance, self-awareness, etc. singing promotes both a healthy heart and an enhanced mental state as well as improving your immune system — so you will live longer! 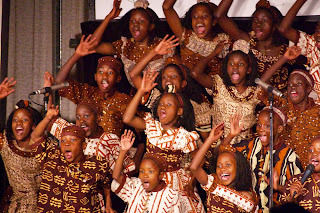 recent Swedish research has shown that choral singing has strong effects on well-being, in that positive emotions increase significantly, and, in turn, negative emotions radically subside. Choral singers, particularly women, are happier, more alert and relaxed after a rehearsal. I’m sure there are many, many more very good reasons for joining a choir or attending a singing workshop. Do let me know if you can think of any others! Next week: How to start your own community choir.